Tis the season to welcome overnight guests! It goes without saying that traveling during the holidays can be a rough gig so treat your friends and family to a bit of special care to help them unwind, as well as have everything they need right at their fingertips. You don’t need to have a full, luxurious suite to be a great hostess. A couch and the right extras are wonderful as well provided you’ve thought through their needs. Consider your home a more charming and cozy version of a luxury hotel and you can’t go wrong! At a minimum provide a comfortable bed with soft sheets, a chair for reading and making phone calls and a variety of oft forgotten items. 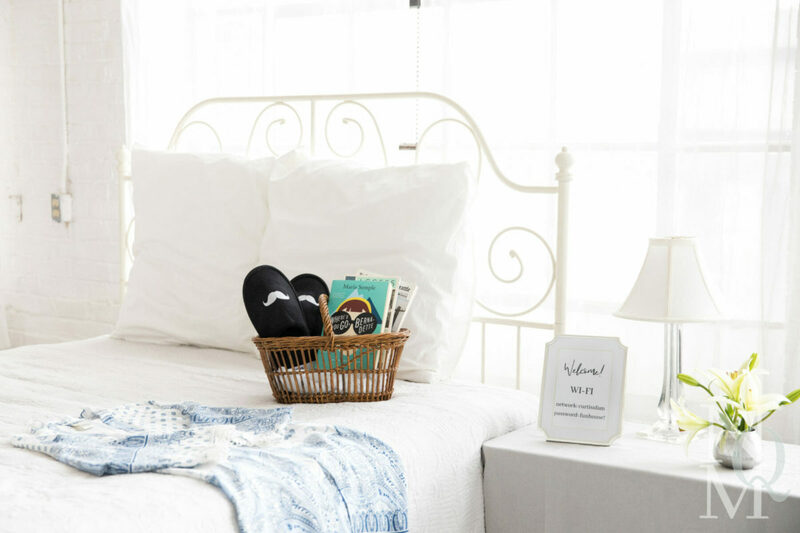 Grab a few baskets and fill them with the items below, put the fresh linens on the bed and clean towels in the bath and you’ll have one grateful guest! One of the biggest no-no’s when creating a restful retreat is to over clutter the space with both furniture, layers of pillows and bric-a-brac. Basically, a cramped and fussy, overly decorated space isn’t relaxing so decluttering is on top of the to do list. Part of this is clearing a spot in your closet or at least providing a coat rack or some hooks and a handful of hangers. Another key to do is a refresh of all the linens in the room and a thorough dusting; this is true even if it looks pretty clean, since infrequently used rooms get musty and dusty. If comforters and curtains are not washable, just run them through the dryer on air cycle to remove dust. Even if the sheets and towels are clean but not washed recently, they should be re-washed (sorry!). Neutral, calming luxury scented candle: note the emphasis on the words luxury – inexpensive candles are often way too strong and cloying – and neutral and calming. I love this Nest set as it offers a variety for a guest to choose from, but most by Diptique or Jo Malone are lovely choices too; and don’t forget the matches. Nunn hydration tablets – great for post plane flight dehydration.